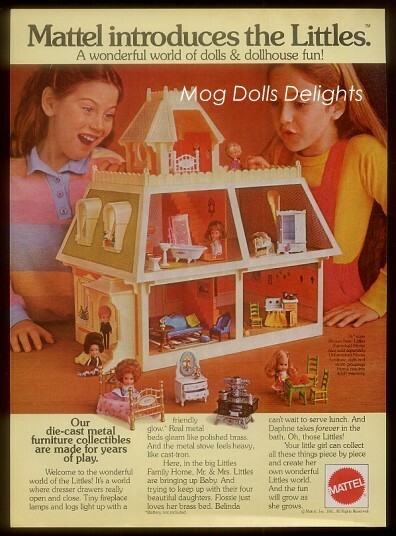 LollipopsDaydreams: The Littles, my first doll in the 1980s! The Littles, my first doll in the 1980s! Can you remember your childhood dolls and toys? I do! There are some that stay in my mind more than others. Sindy of course is one. No question there. I had one blond doll for awhile until I managed to get my hands on a second doll. I would tuck her into bed every night in her own little dolls bed which rested next to mine such was my devotion. But my very first dolls were actually the Littles. These were dolls and furniture that would made by Mattel in 1981 for a year or two and were absolutely tiny. The scale is about 1:24 (Barbie is 1:6) so very small stuff. My own dolls have long since disappeared and after a search on google I finally figured out the name of these dolls from my memories. This is the dad, baby and mother. I took these straight out of a box so they are like new. I wonder how many of the baby dolls ended up in the hoover? A lot I am guessing. Does this bring back memories for anyone? I had lots of the little furniture too, most of it is cast iron so it was built to last. A year or so ago I bought a small lot of the furniture on ebay (nostalgia got to me) and its now all set up in a Sylvanian dolls house by my children in the room where I do all my crafting. It buys me a lot of quiet time!! Next weekend I have stalls at two craft fairs so I am still busy making lots of new items. As I am new to all this it is hard to work out how much exactly of everything I need so I am aiming for more than I think I need (I think). I've made lots of shabby chic style bunting this week and am now working on some boys cushions (counteracts the girliness of the bunting). I've closed my etsy shops for a little holiday while I go to the fairs but I'll have plenty more stock and new items to add when they reopen. I love the bunting! It's so pretty! I wish you good luck on the craft fairs! Thank you for your comments. I had a look at the Chimney Pot, I think it was after my time so I don't remember it, the kids here would love that. You are so lucky all your toys were kept, loved the my little ponies too. Thank you for your kind wishes, I am a little nervous but I am sure it'll be great fun once I am there! In my day it was Pippa dolls - I still have some that my daughters played with and my favourite pastime was making clothes for them. I wasn't able to keep a pair of shoes for any of them as they were so small they were always being swept up by the vac! We have some Dawn dolls here(American version of Pippa as Pippa is very expensive to buy now!) and I know exactly what you are taking about those tiny shoes, how any still exist is a miracle!